Silhouette Cygnus- Built with permission from Cygnus Engineering, this version of the Silhouette incorporated a self inflating airbag for pilot protection. 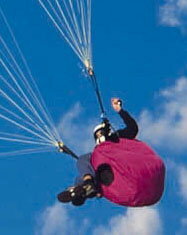 It is fully inflated two to three seconds after take-off and offers excellent pilot protection. Safety, economy and quality in one package. A variety of adjustments for individual flying styles and performance. A good blend of comfort and pilot protection with ample storage space. Excellent for weightshift steering and with Cross Bracing as an option. The Silhouette Cygnus will accomodate a variety of additional pilot protection systems including Airfoam and Side protectors. The Sihouette Cygnus is available in four sizes: S, M, L and XL. 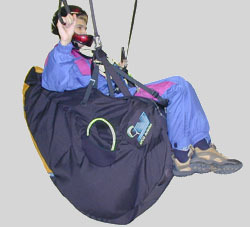 It is possable to order your Silhouette Cygnus with many different options, either factory installed before shipping or added later yourself, including four different reserve parachutes, back protection systems and side protectors. Click on the links below to find details about pilot Protection and more.